For other places with the same name, see Medina (disambiguation). 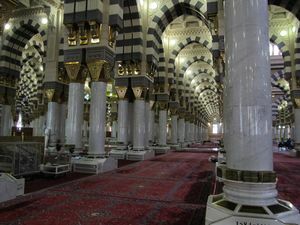 Medina (المدينة Madinah) is a city in Saudi Arabia, to the north of Mecca. Medina is the second holiest city of Islam. 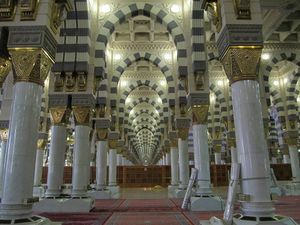 The Prophet Muhammad migrated to Medina from Mecca, and taught there for some years before his triumphant return to Mecca. The city is commonly visited as part of the Hajj and Umrah pilgrimage. The Prophet built the first state or government in this city. Islamic Political Model i.e (Caliphate or Khilafat), Islamic Economic Model (interest-free, commodity currency i.e. gold and silver coins based system, an alternative to capitalism and socialism) were being implemented for the first time over here. The city of Medinah is also home to the Prophet Muhammad's final resting place. The green dome is the destination of millions every year, since 1440 years. It also has multiple holy sites besides the dome, like Jannat Al Baqee, Uhud Mountain, Masjid Ghamama, Masjid Qiblatain, that Muslims visit due to their association with the Prophet Muhammad and his companions. 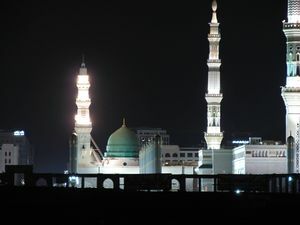 The city full name is "Al Madinah Al Monawarah" which mean “the lighting city or the city of light”, that name was given to the city after the prophet migrating in 621 a.d. The old name for the city is "Yathreb"
Medina has a hot desert climate, influenced by its altitude (600m or 1960ft). Winters are colder than the holiest city in Islam, Mecca 400km to the south and the average daytime temperature is 18°C (64°F). Nighttime lows are around 12°C (53°F), while occasional surges of cold air from the north can lower temperatures to 5°C (42°F), but long, very cool periods like this are rare. The lowest recorded temperature is 1°C (33°F). Summers are shorter than Mecca, but hotter as the average daytime temperature in August is 37°C (98°F), while Mecca's is 36°C (97°F). Afternoon highs can reach 44°C (111°F) and the record high is 49°C (120°F). WARNING: Non-Muslims are strictly prohibited from entering Central Medina. The penalty is deportation from the country. Documentation will be checked upon entry and anyone not showing proof of being Muslim will be denied entry. However, many parts of the city, notably the outskirts and the Medina Airport, are open to all. 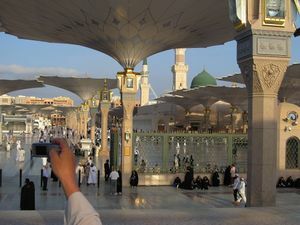 For pilgrims, the most common route is to arrive in Jeddah by plane, and get on a special pilgrims' bus to Mecca and Medina, and come back to fly home in a couple of weeks. However, Medina's Prince Mohammad Bin Abdulaziz Airport (IATA: MED) fields an increasing number of direct flights from around the Middle East, and the airport is accessible to non-Muslims. Keep in mind that this is a very small airport, and not really designed to cope with the large numbers now passing through it. So expect a crush at the baggage carousels. And expect a free-for-all in the check-in areas, where queuing seems to be (literally) a foreign concept. SCAM ALERT: As you leave the secure area of the Medina airport and into the arrivals hall, if you look like a well-to-do visitor from a wealthier country, you will be approached by a confident and well-spoken man demanding to see your passport. This person is NOT an airport or government official, but is actually working for a local taxi company and you should demand to see ID if anyone asks for your passport. If you do give him your passport, he will then ask you to follow him to a desk where it will be handed over to someone who will pretend to be scrutinising it carefully for a while and then tell you to follow one of his colleagues to the taxi rank where you will certainly be hideously overcharged for your journey into central Medina. There are standard set prices for taxi journeys from the airport into central Medina, as set by the government, and these will be listed on signs in the car park area. Do not be tricked into paying over the odds. The Saudi Arabian Public Transport Company (SAPTCO) runs to and from luxurious buses several times daily from most parts of the country at cheap rates. There are also privately run buses. The SAPTCO terminal is off-limits to non-Muslims. You can use buses from the airport to the city downtown and from their to nearly 10 bus stop around the city, also you can use Uber and Careem ( the Uber competitor in Medial East and North Africa). the u can find Taxi Services in the airport, Malls and Hotels. 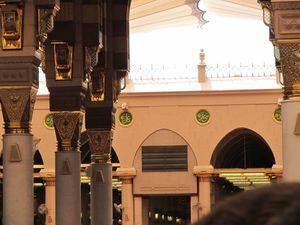 Since it is visited only by Muslims, for religious purpose, the main thing to see is the Masjid Nabawi or the Prophet's Mosque where devout Muslims offer prayers. 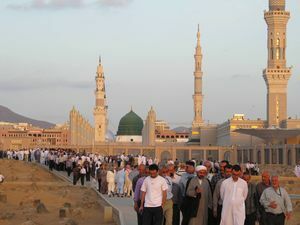 Men are allowed to visit the actual burial site of the Prophet and pay respects throughout the opening hours of the mosque, which used to close for the night at around 10PM but has since become 24/7. Women may visit only after the Fajr or dawn and Duhr or afternoon prayers, when they are taken there in groups according to their countries. In fact most of the things to be done or seen are around this grand mosque which is at the city centre. 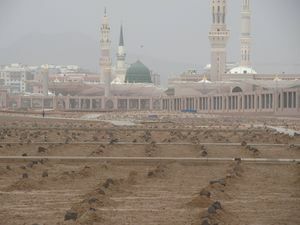 Adjacent to the mosque is Jannatul Baqi, a huge graveyard, where most family members and companions of the Prophet are buried. Other things to be seen ,a little away from the city,are the plains and mountain of Uhud where the battle took place. There is also the burial ground of the 70 martyrs of this battle including the Prophet's uncle Hamza who is considered one of the greatest martyrs of all time. Further away is the Masjid Qiblatayen where the Prophet was ordered by Allah to turn his face from Masjid Aqsa in Jerusalem to the Kaaba in Makkah while offering prayers; Masjid Jumua where the Prophet prayed the first Jumua or Friday prayers; Masjid Gamama where once he had prayed for rain; Masjid Quba at Quba, which is the first mosque of Islam. Another place worth visiting is the battleground of Khandaq or the Trench. Also Medina Are famous for palm plantations and the most popular date is "Ajwah" and "Rothana"
Visit the grand mosque called Masjid Al-Nabawi. 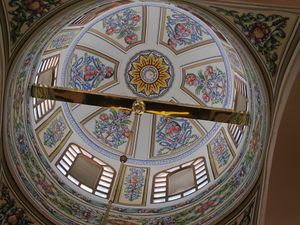 The Prophet Muhammad's burial site lies inside the mosque, along with the astonishing view and glamorous architecture of the beautiful mosque. The streets leading to and around the Prophet's Mosque are lined with shops selling goods of every variety. Visitors to Madina usually buy prayer rugs (some with magnets pointing towards the Kaaba), caps, Tasbeeh or prayer beads, Abayas, pictures of the holy city and mosques, religious cds, copies of the Holy Quran, clocks sounding Azan or the call to prayer ( correct to the second) for nearly 5 million cities, etc as souvenirs to take back with them or as gifts for family and friends. The best of them to take back are Dates from Medina. There are also huge glittering shopping complexes and malls selling goods from all over the world. Credit cards are largely unaccepted, and few banks will exchange travelers' checks. Prince Mohammad bin Abdulaziz Airport (Domestic & International Terminals)-(24 hours). 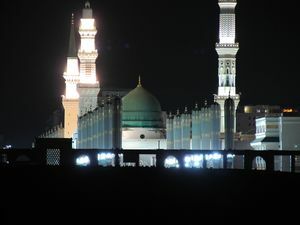 South & North of the prophet mosque, Tammara ( 5 A.M- 12 A.M). 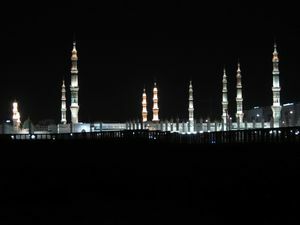 In front of Quba Mosque (5 A.M- 10 P.M). In front of Sayed Alshuhada Mosque (5 A.M- 10 P.M). There are restaurants selling almost all types of food from all over the world. There are Indian, Pakistani And Bangladeshi restaurants in abundance. There are also Chinese, Indonesian, Turkish, Egyptian, and local food available. The well known western fast-food chains like Mc Donald's, Pizza Hut, Don Giovanni's, and KFC all have outlets, as well as the country's own famous fast-food chains like Al Baik, Kudu, Hardees, etc. also abound. The cheapest local delights are shawarma, taamiyya (a type of vegetable sandwich), foul (cooked beans) with tameez (bread), and roasted whole chickens called Broasts. Alcohol is prohibited. On the other hand, Medina is famous with various type of mint so you can try the tea with fresh "Hasawi Mint" which is very good experience to try or with "Dosh Mint" or "Magrabi Mint" and other types. 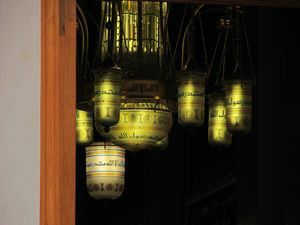 Medina has many hotels, most of which are very close to the Mosque,as it is visited mostly by Muslim pilgrims. The following hotels are for Muslims only. Numerous 5 star hotels have been and are being constructed all around the Prophet's mosque within a radius of 500 m.
Beyond these are many budget hotels extending miles from the Masjid Nabavi. The tariff depends on a hotel's distance from the mosque, the nearer the more expensive. Even these low cost hotels have facilities like proper beds with clean linen, carpeted floors, air conditioning, refrigerator in every room, tiled bathrooms fitted with either eastern or western type WCs (sometimes both), 24 hours running hot and cold water. Kitchens with LPG and burners and sinks are also available for those pilgrims who would like to cook their own meals. But now all of these small old hotels are being demolished on a large scale to make way for starred hotels. The following hotels are open to all. LeMeridien Medina, . Previously the Sheraton, this is the only branded hotel in Medina open to non-Muslims. Near the airport and often used by airline crew. One night is about 600 riyals. Mecca, is the other holy city, and visited by people taking part in the Umrah (minor pilgrimage) or the Hajj. You can hire a taxi to take you to Mecca, which will cost about 500 SAR for up to four passengers. A much cheaper way to get there is to use the SAPTCO (Saudi Arabia Public Transport Company) bus services instead. There are two versions: regular and VIP. The regular service is reasonably comfortable and will cost 55 SAR per person. The VIP version (which you can catch from the Crowne Plaza hotel) is slightly more luxurious and will cost 100 SAR per person. This page was last edited on 23 April 2019, at 08:54.